Remember the piece of fabric I showed last week? These two blocks are digital images of two of the 8 stacks of triangles. Do I have your attention now? 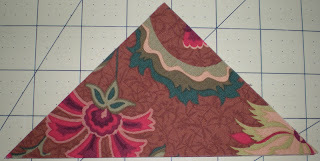 I'm going to show you what happens with another fabric that I cut up into 8 squares and then again into 8 triangles. This will work with any large scale print! This technique is not unique with me. 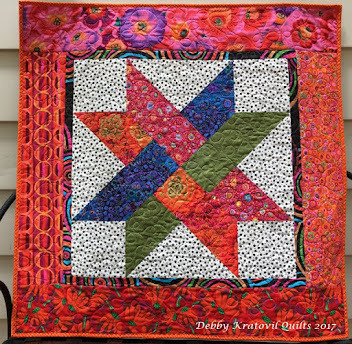 I saw it demonstrated 10 years ago by Kay H. in Atlanta when we were part of a local quilt guild. But this sure beats the Stack 'n Whack method in simplicity. 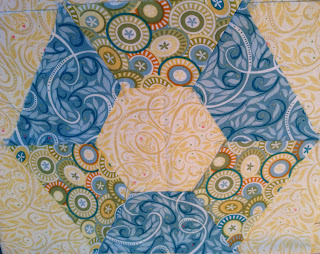 Here is a scan of the original fabric. 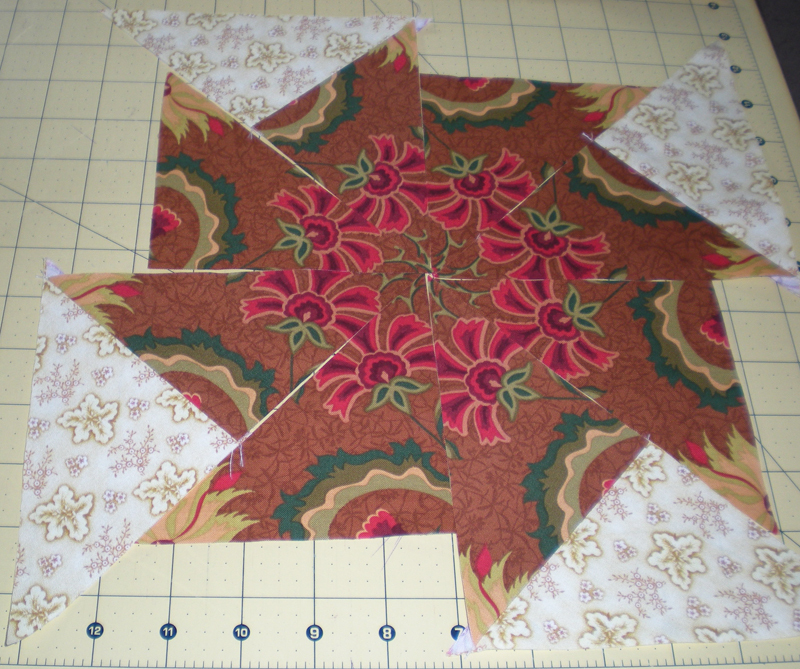 Start with a 9-1/2" square. Cut 7 more with EXACT print placement. 1. 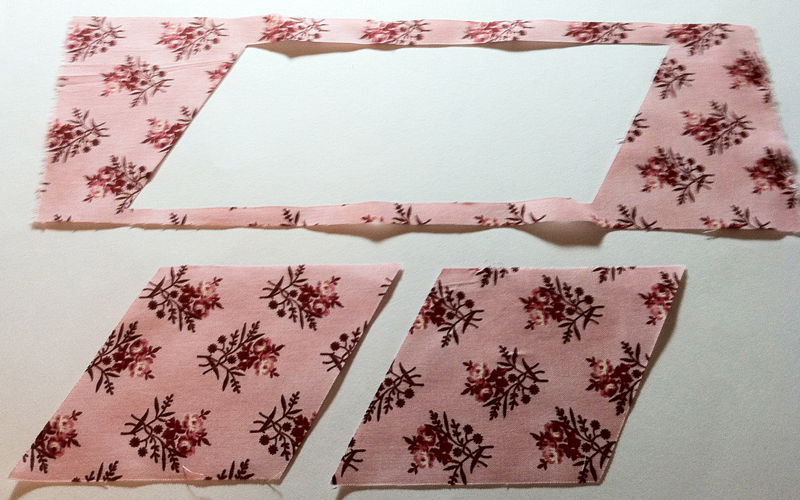 Cut 7 more squares of fabric that look exactly like the original. 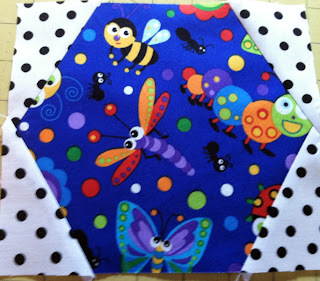 Yes, you will have large "holes" in your fabric. 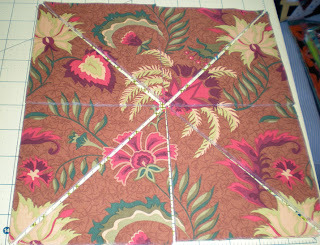 You are looking for repeats of the pattern, but you only have to cut a total of 8 squares 9-1/2" x 9-1/2". 2. Stack the 8 squares and cut in half along both horizontal and vertical and then again along both diagonals. Leave the 8 stacks of 8 triangles each as they are. You will be working with only ONE stack of 8 triangles at a time. 3. 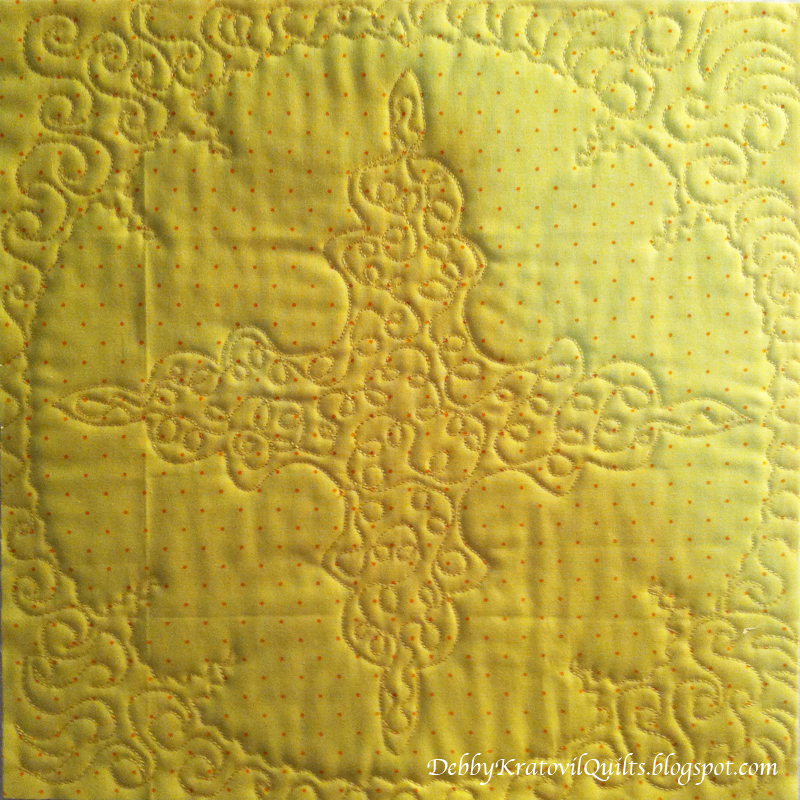 Cut 4 squares 9-1/2" of background fabric (in this case, light yellow) and also cut along vertical, horizontal and both diagonals. You don't have to worry about mixing these up; they are all the same! Join 4 of the 8 print triangles with 4 of the background triangles. All 8 triangles (from one stack) arranged. What are those holes? Well, we're not done! Note that is is helpful to "audition" your layout to make sure that you are sewing the background fabric to the correct side of each triangle. 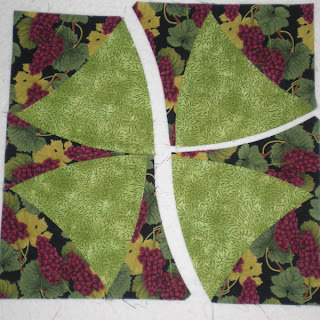 In this case, the yellow triangle was consistently sewn to the side of the print triangle where the green/cream curve occurs. This way all of the flower points are in the center. Don't mix these up or you won't get the kaleidoscope effect. 4. Cut 5 strips 2-1/8" x wof. 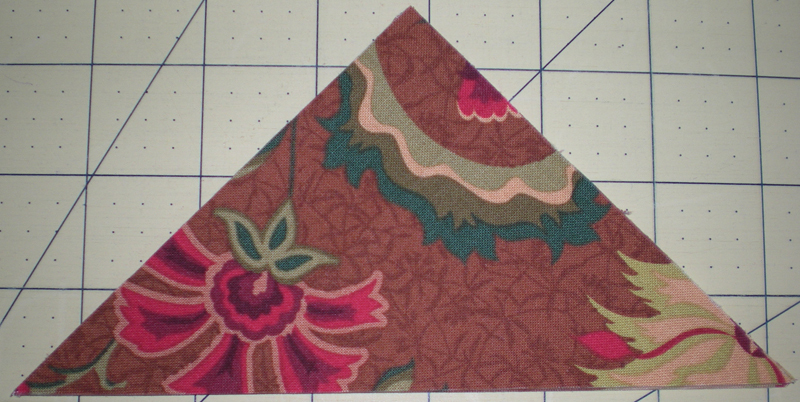 Re-cut into rectangles 2-1/8" x 6-1/2". Note the artwork below. 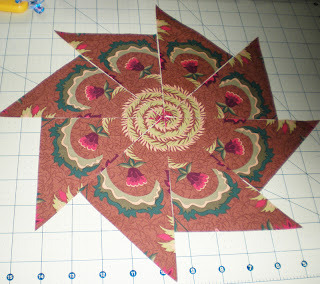 You can get your pinwheels to spin either left or right (or both ways if you weren't paying attention, as I wasn't!!). Don't you just love the way that center twirls? Patches from pic above sewn with the yellow print. Love that spinning flower! Just look at that center wreath formed by the flower sections. I didn't plan that perfect vine circle at the edge of the triangles! And what do all those blocks look like together? Each stack of 8 squares will yield 8 blocks. OK. I'm done. Hope you enjoy this. Please let me see your blocks if you take this adventurous challenge. There is no way I can tell you how much large-scale print fabric you will need. It all depends on the repeat. 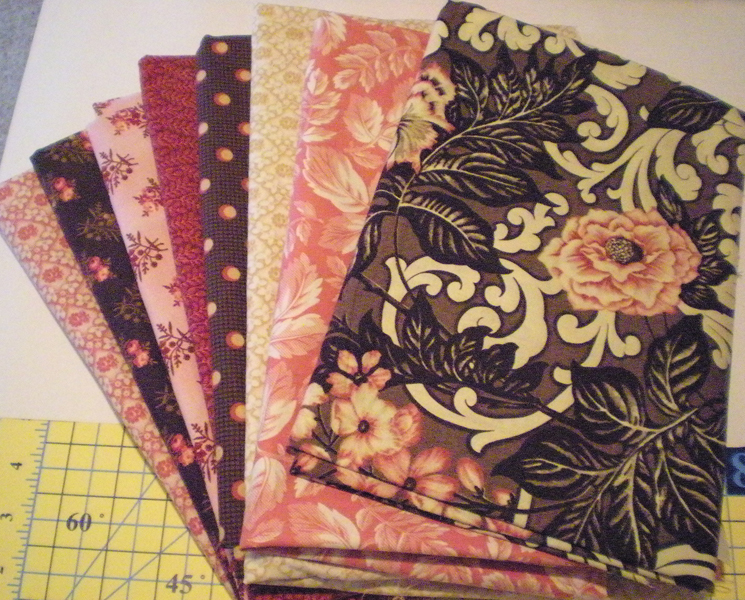 Go take a look at some of that "ugly" novelty print you have in your stash. Once it's cut up, it will no longer be ugly. This is a DESIGN posting and not an exact pattern with lists of yardage. I think it's safe to say that you can probably get your 8 squares out of 2 yards of print. I bought 2 yards of an awesome ethnic/African print the other day and can't wait to try this again. So much sewing, so little progress! As an adult with ADHD, I am very comfortable to have more than one project going at a time (OK, I typically have no less than 20 projects in some sort of completion). So, while my head is planning, my little hands can't keep up. But here are the projects I am working on NOW and do plan on posting about in the next several weeks. If you are not a regular follower, what are you waiting for? 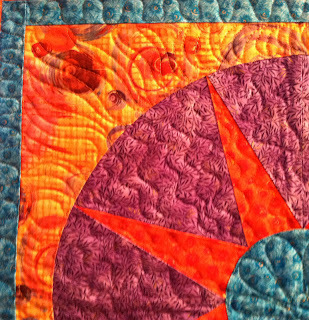 Be the first to know when I've posted a new quilt. I have one grandson, any day now a second one. I have made 5 blocks of this wonderful, improvisational piecing quilt (using foundation piecing plus just strips). 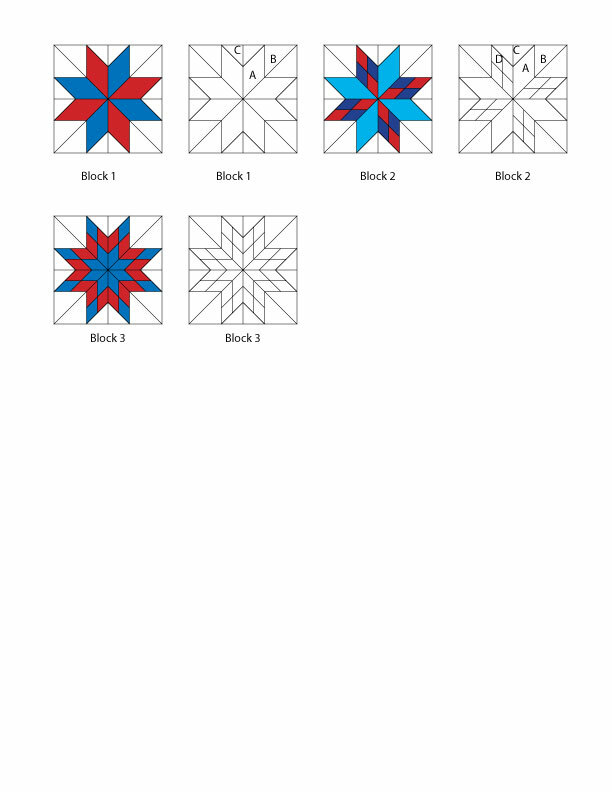 I asked and received permission from QNM to post my blocks and a link to their free pattern. Coming asap! Boy, did I get a lot of requests for this pattern last week on the Wicked Blog Hop. I pulled out my instructions and am now dusting them off. 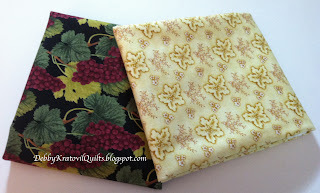 I even went to a local quilt shop and bought some fabulous large-scale print fabric to recreate a step by step tutorial. 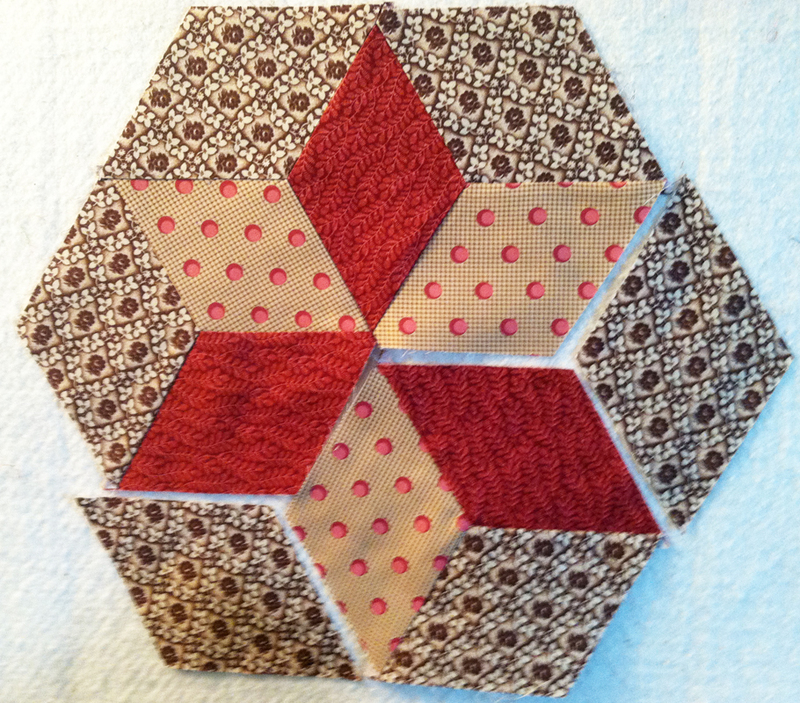 I have another set of blocks and another quilt (using a hexagon shape) that I will post. Keep watching! 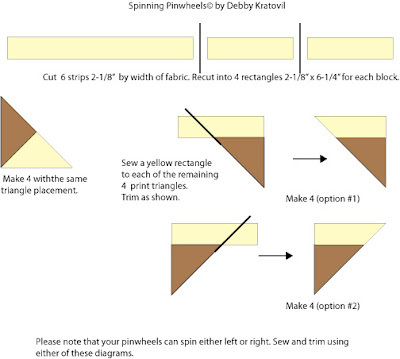 More pinwheel blocks made with a luscious, large-scale print. I have step by step pics! I just found that I photographed these brown blocks last year. Wow! And I took pics of the steps. My brain was getting in gear for a blog, I can see that. I will work on this posting this week (unless Hurricane Sandy messes up my dots; we're in the path of the storm). I will be starting an entire section of this blog dedicated to Turning 60 (no, you can't ask a lady her age!). 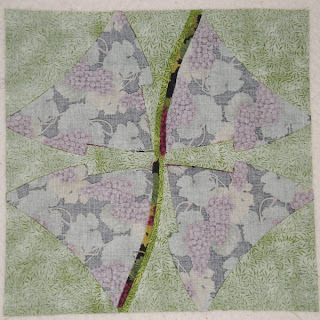 This little block is one of 15 in a quilt I designed and am finishing right now (well, not exactly this minute, but this week). 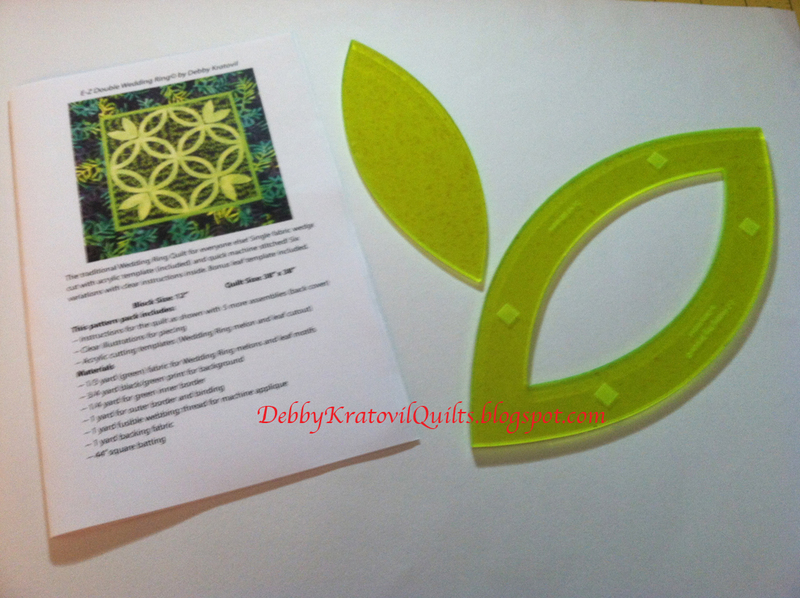 It is cut with my multi-sized 60 degree ruler and is easy, quick and fun, fun, fun! 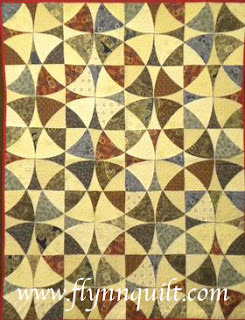 The Turning 60 page will feature dozens of quilts that I've made in the past years, have been published and are all based on the 60 degree angle. 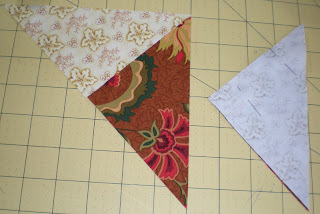 Wait until you see my table runner I'm making with some new Anna Griffin fabric. To die for! I love half-hexagon shapes. 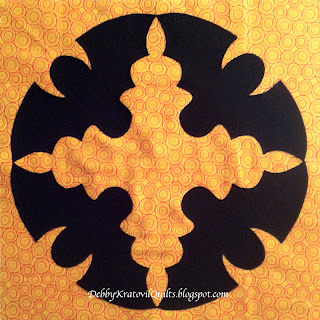 I have a few quilts I will be revealing using this shape. 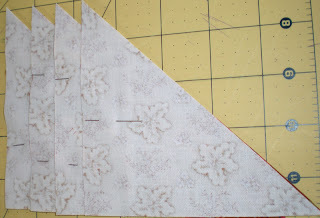 The block above is cut with my 60 degree ruler (any 60 degree ruler will work). There are NO set-in seams; all straight sewing (see the Bugalicious image above to see the side triangles). Easy strip-pieced Kaleidoscope blocks. This will be my Thanksgiving table runner. 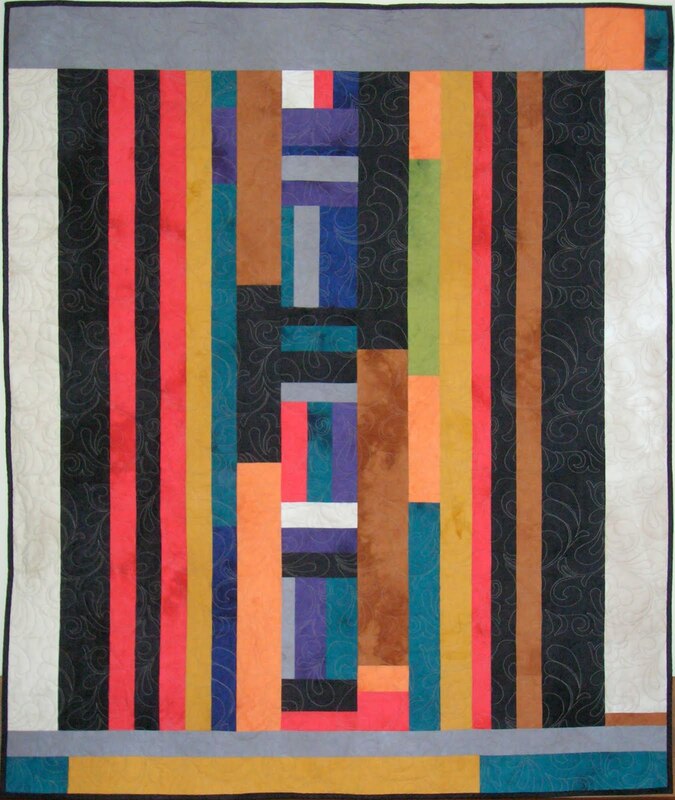 Using my multi-sized Kaleidoscope Ruler (up to 12" size blocks) makes this a great way to use up all those strips and strings (well, maybe not all, but most of them). OK, I'm done with the preview. Hope you stay tuned. If you're a follower, you'll get notice. Again, remember, I'm in the path of Hurricane Sandy and not sure if the giant trees in my back yard will stay put. Planning on a power outage, but it may not last too long (my power lines are buried underground). Stay safe wherever you are! And, sew something every day! Wicked is usually a word I associate with bad things, people, the devil and other scary and BAD things (I think I said that twice, didn't I?). But my friend Jeannine suggested I add the word "cute" so I could manage this HOP. 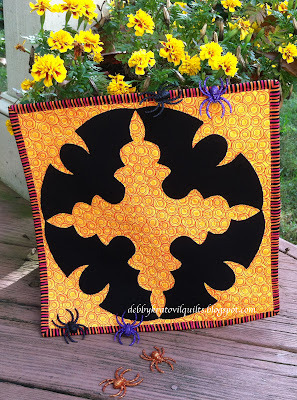 I'm going to start with a picture of one of my favorite Halloween quilts from previous years and then introduce you to my blog for this posting. I do want to thank Madame Samm and Wendy for coordinating this, with all their hard work and encouragement! Just a cheap piece of fabric that I bought for $1 a yard at Walmart! 1. 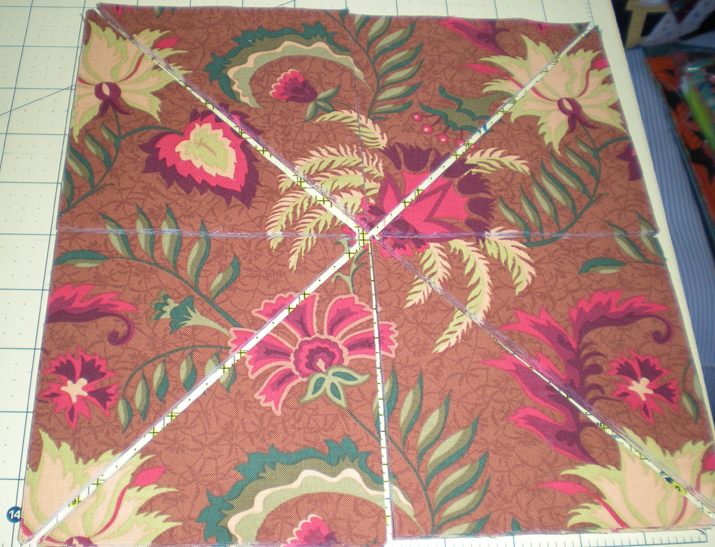 I cut 8 squares 9-1/2" x 9-1/2" so that all of them were exactly like this one. 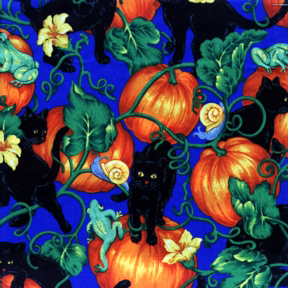 Cats as seen, the frog climbing the pumpkin, everything. 2. I put them all in one pile and then sliced the 8 squares along the horizontal, vertical and both diagonals. Now I have 8 piles of triangles. 3. 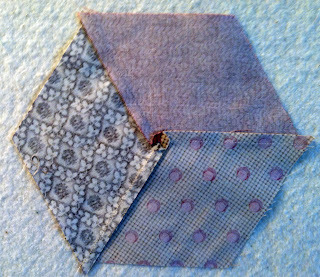 Then I did the same thing with a stack of 4 blue 9-1/2" squares. 4. I added some blue 2-1/2" strips and made pinwheels. Using only one stack of print triangles at a time, I created pinwheel blocks. 5. 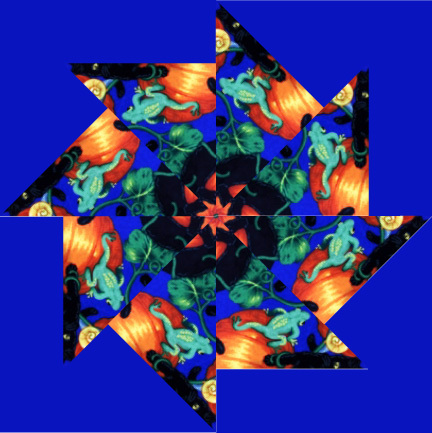 As you can see, the print captured in each triangle spins around from the center, each block unique. 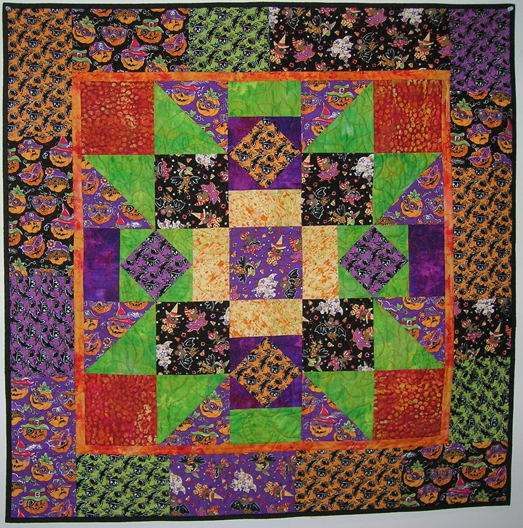 No pattern today (maybe next Halloween), but here is the quilt. 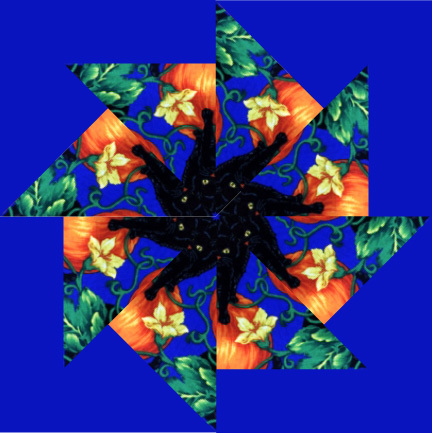 Halloween Pinwheel Quilt (2002) - one of my favorite quilts. The fabric does all the work. Now for my Wicked (Cute) block. A little background. When my husband and I were newly married (1977), living in Africa, we used to play guitars together after dinner. We would sit on the edge of the bed and croon our tunes. Out of the corner of my eye I caught some movement on the bed and then fear gripped me. A BAT WAS CRAWLING TOWARD US. Yikes! He took care of it and then when we went to the kitchen, we found another one floating in our pan of dishwater. Seems they came down this open vent and were looking for a warm place to settle down. Bats are NOT my favorite creature, but they do have a vital place in our ecosystem. 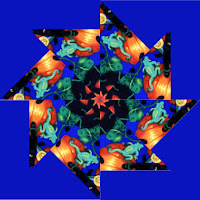 So, my block is a wreath of harmless fabric bats. What do you think? 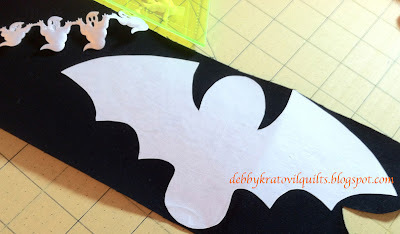 I made a freezer paper template and cut black bats from fused fabric. 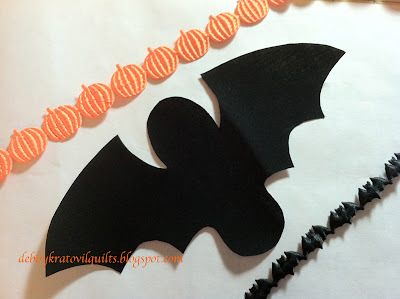 Here is one black bat with garlands of pumpkins and tiny bats. 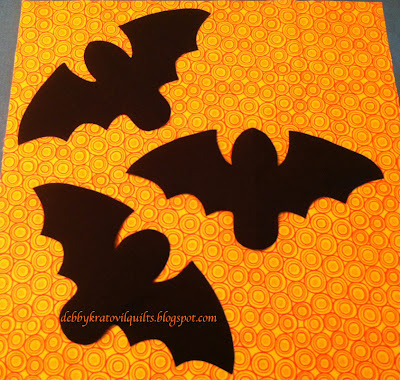 3 bats scattered on my 12-1/2" background square. I finger pressed diagonal lines on the background square and then aligned the bats as shown. This bat has appeared in several of my Block a Day Calendars and I re-sized it so it would work with this size square. Four bats in a circle. Note the beautiful secondary design in the center. 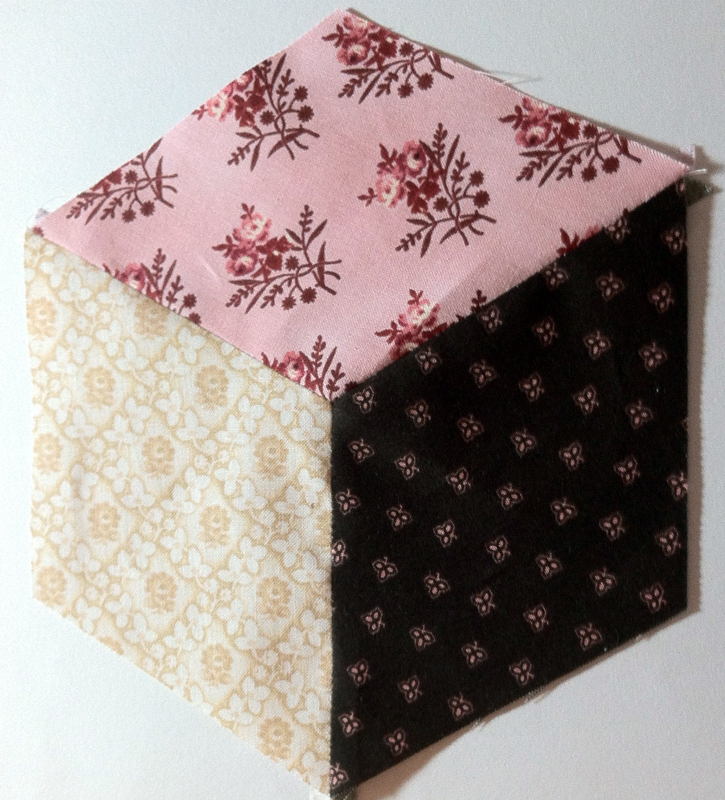 Since it's just a small one square project, I was able to quickly free-motion quilt it. Here it is from the back. 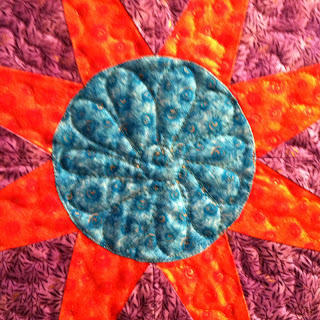 You can see my quilting better from the wrong side. I took my finished block outside for better photography. I grabbed a few glittery spiders for "mood." 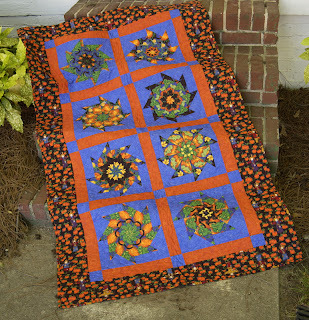 I have a winner in my Quilts in the Pumpkin Patch. I'm waiting for Sherry B. to send her snail mail address. I have 3 more giveaways on Thursday for my Wicked Blog Post, so please check back for an awesome block (with free pattern), another halloween quilt, and 3 freebies. What's Halloween without costumes? When my 3 girls were young, I refused to spend longer than one hour on any costume. 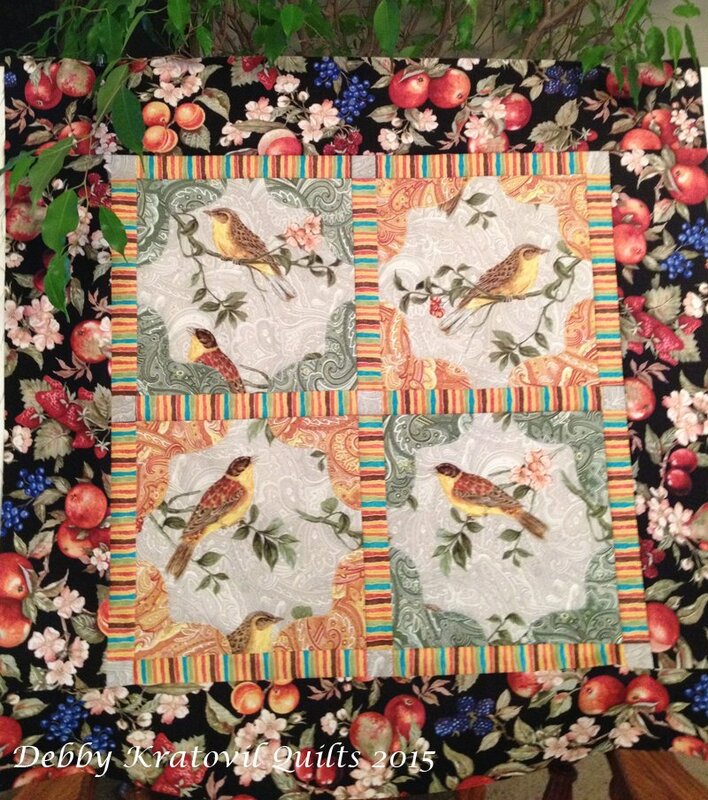 I had to devote my precious sewing time to quilting. 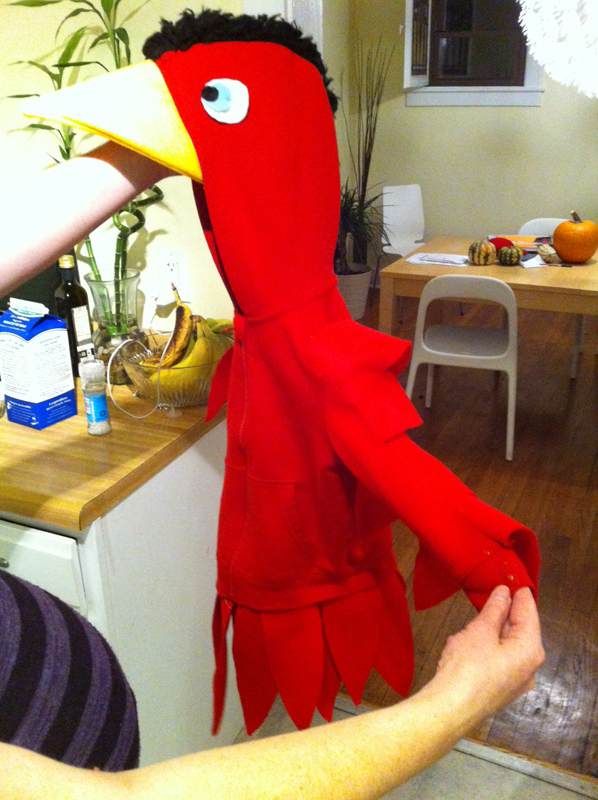 Now my middle daughter makes costumes for my favorite grandson (he will be 2 in November) and here is the conversion of a hooded sweatshirt (that came with the mohawk fringe) into a rooster. Isn't this the cutest thing! Hooded sweatshirt transformed into an awesome rooster! Now, how about a Halloween quilt? 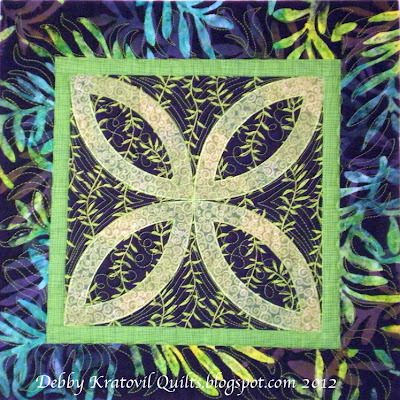 Here is a simple one from my book Supersize 'Em Quilts. See you on Thursday for the Wicked (cute) blog hop! 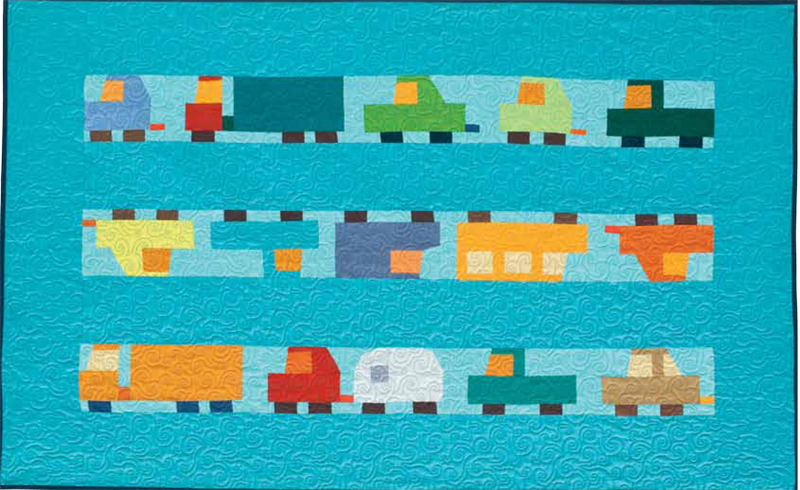 I try to feature Windham Fabrics on Wednesdays and today I'd like to go back to the future. 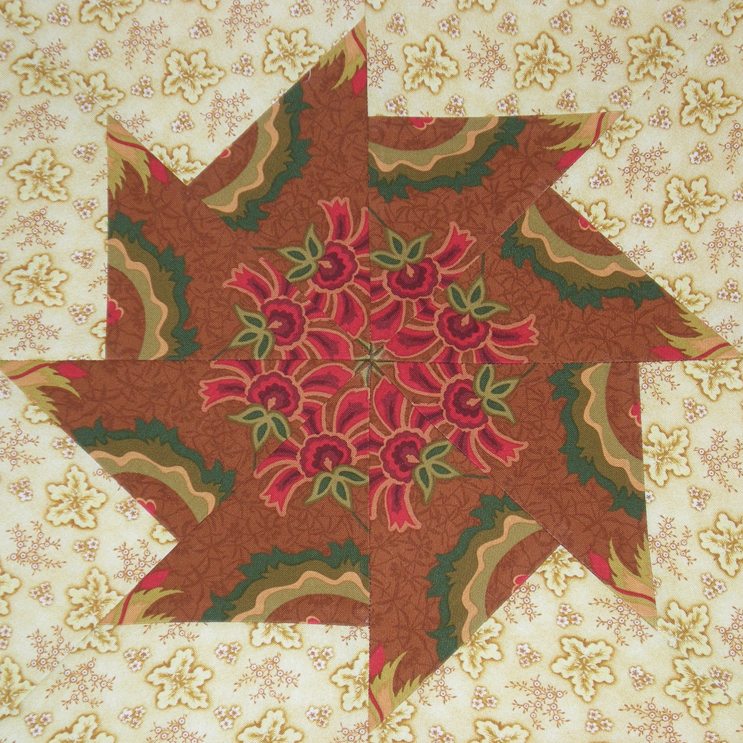 My book, Supersize 'Em Quilts, features a fantastic ROTARY cut LeMoyne Star quilt with variations on the star block. 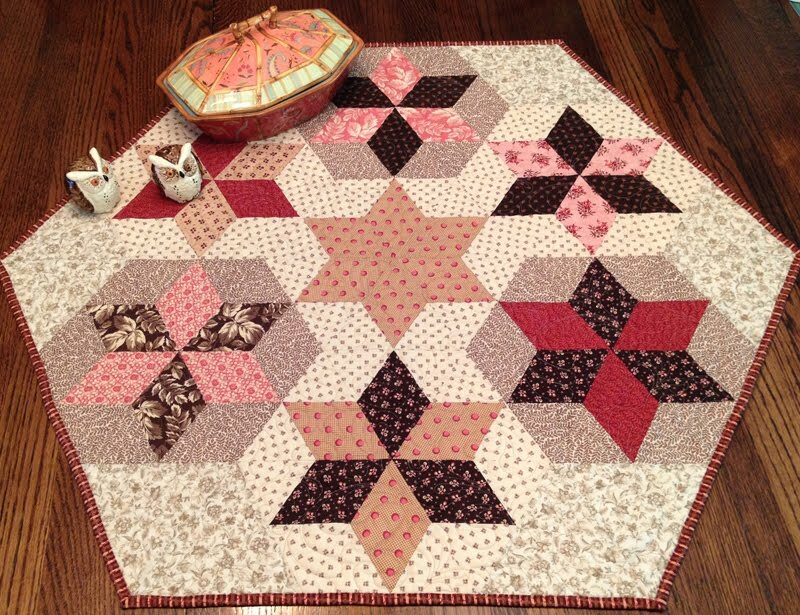 This uses a beautiful collection of fabrics from years gone by, but I'm sure you can find a variety of fabrics in your stash that would work with such an easy to piece quilt. The "easy-ness" has to do with NO templates and ONLY rotary cut diamonds. What? Rotary cut diamonds? Impossible. Not so. Texas Stars - 20" block!! Can you see the 3 different blocks? Don't you just love it? Why do you think you have those 45 degree angle lines on your acrylic rulers? To help you rotary cut these strips. Check out my web site to see the special price on this book. 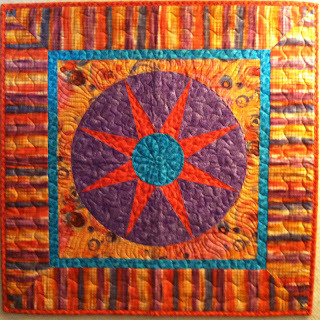 And you can see a slide show of ALL the quilts - all 22 of them, by clicking on that link. 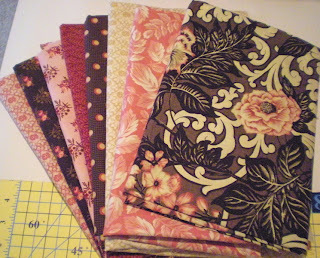 Next time, another quilt, another group of fabrics. 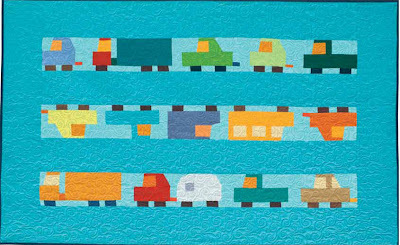 All these fabrics, all these quilts, so little time. Pick your favorites and GO SEW! Update: My contest for 3 giveaways in the "Leafs Me Happy" blog hop closed at midnight last night, October 10. I am out of town teaching until Saturday, but will select and notify the 3 winners by Sunday. Many thanks to all who shared such nice comments! I blogged about the Addison Collection a few weeks ago by showing a step by step tutorial for Garden Maze units. 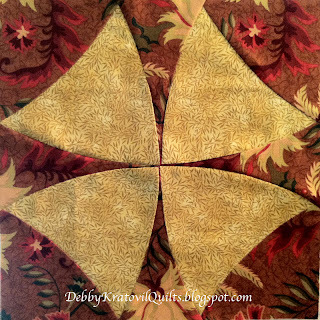 I asked a quilting friend and fellow teacher, Nancy Bills, to help me with an idea. She is an awesome designer using the AccuQuilt cutters. She thinks like I do (yes, a little crazy at times, but always with a new quilt in mind) and realized that she could get extra patches from the cutter if she loaded larger pieces of fabric. 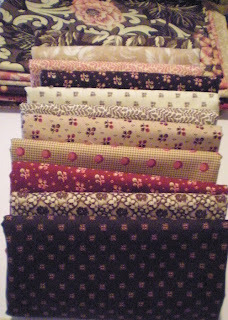 She took home my box of these fabrics and used the 60 degree template/die and cut a huge stack of beautiful diamonds. But what do I mean by getting extra patches? 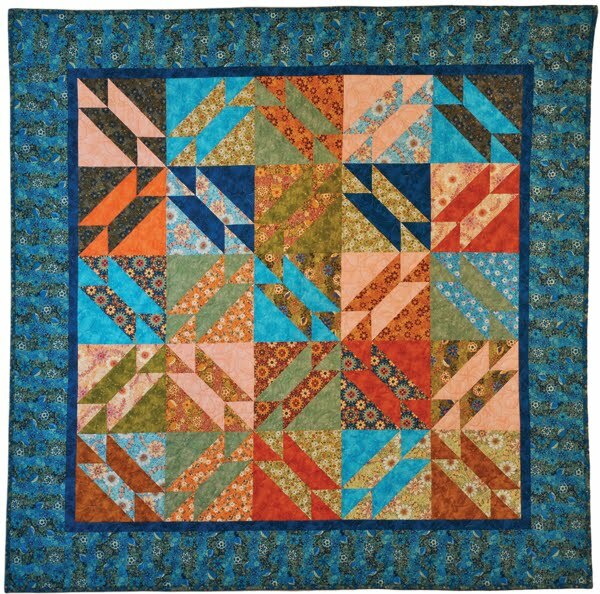 She cut larger than needed rectangles of fabric and the outside excess gives me half-diamonds to use in setting these diamonds in a variety of blocks. Now, what am I going to do with them? Am I really up to setting in those y-seams? It's time for me to grow up and do the hard stuff. Yes, I am up to the challenge. Now, let me show you what Nancy did with her collection of the Addison fabrics. She bought another piece of the beige floral and then cut birdhouses, birds, hearts and created baskets from other wedges, all using the Go Cutter. She will be putting the border on later this week, so I'll update with a better picture by week's end. 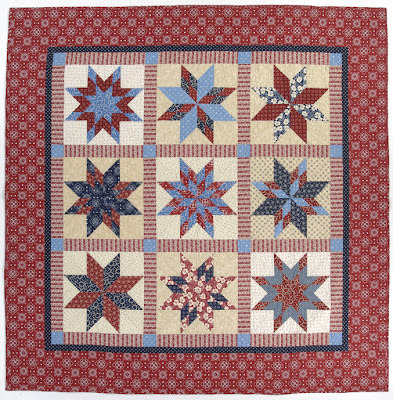 What kinds of quilts does Nancy Bills make and teach from? Well, look at this! This two fabric Pineapple has almost 200 antique buttons sewn on the border. 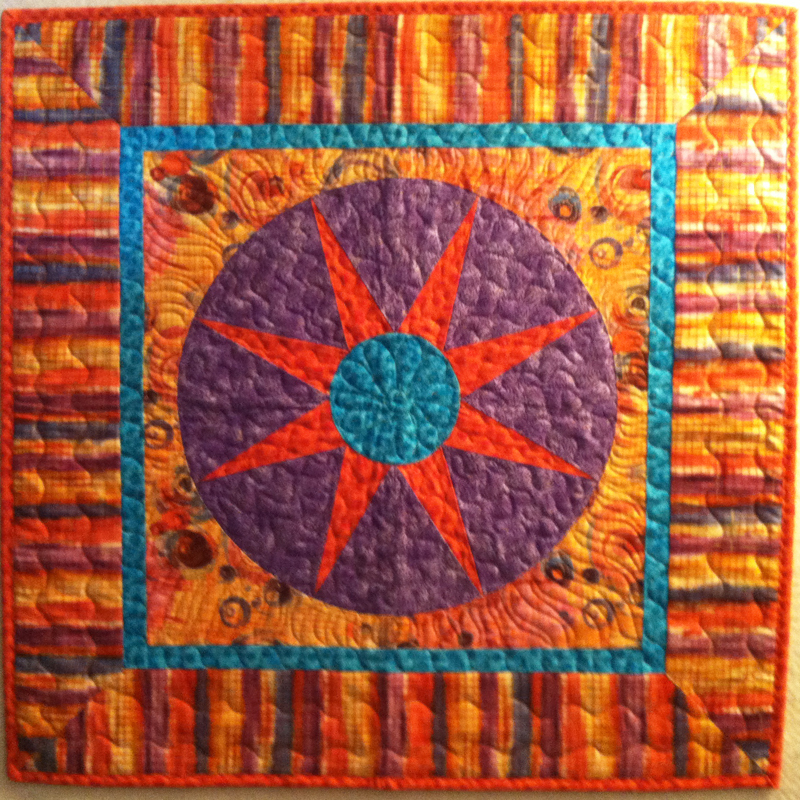 Nancy has an awesome gallery of quilts. 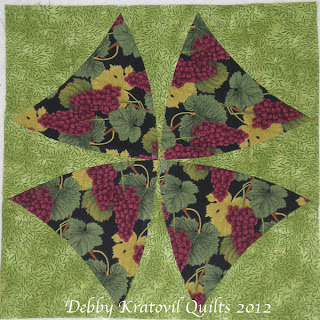 Visit the page that shows all her Pineapple Quilts. Well, I'm done for the day. I'm packing and getting ready to teach 5 classes in Kansas City. I hope you enjoyed seeing some more of this Addison Collection. I'm not done with it, so stay tuned! I like Columbus Day. I'm half Italian and one of my sons in law is from Spain. A quick historic recap: Christopher Columbus was Italian and got his funding from the Queen of Spain so he could come over to America and "discover" us. 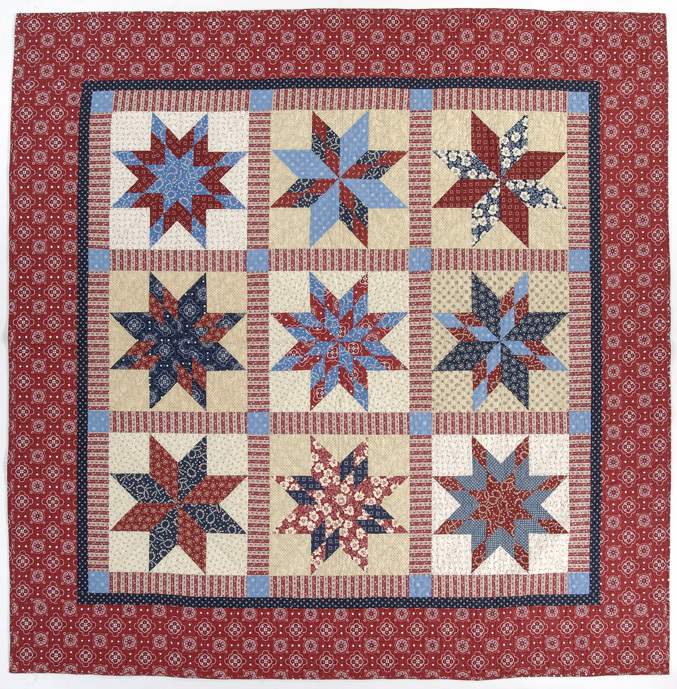 No politics discussed on this blog; only quilts, a universal, happy language! What do I have today? I wanted to post about Mariner's Compasses because that is the tool that kept many a mariner from sailing off into a watery death. In fact, my next book features a dozen compasses and I will post about that soon. This is my simplified compass, easy enough for beginners. There are only two points in each of the four corners of the block. They are foundation pieced and then set into the curved background. 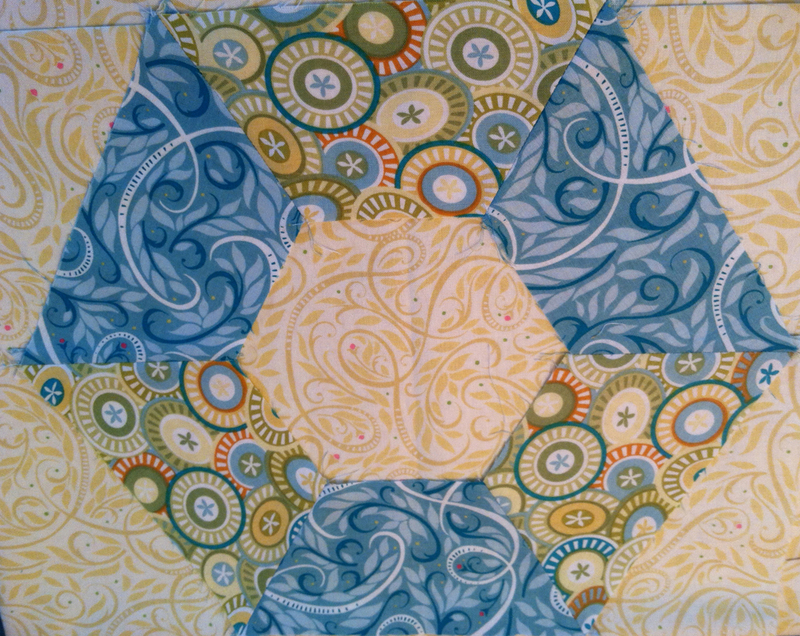 1/4 of the compass block - can you see my quilting? The last patch to be added is the center circle. 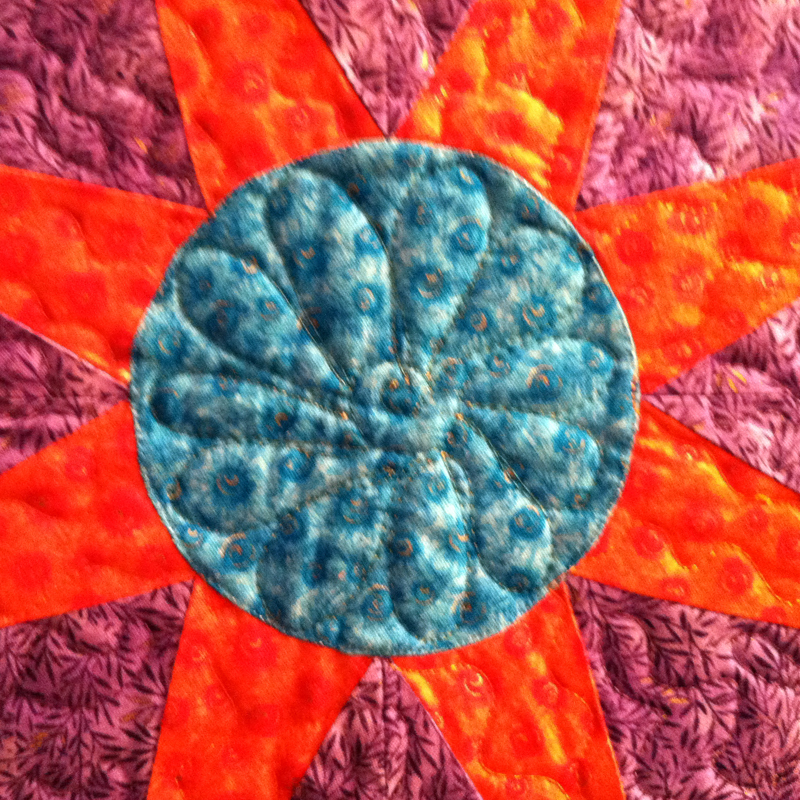 I faced the circle with lightweight interfacing and then turned it right side out; placed it on the hole in the center and then zigzag machine stitched it with invisible poly thread. 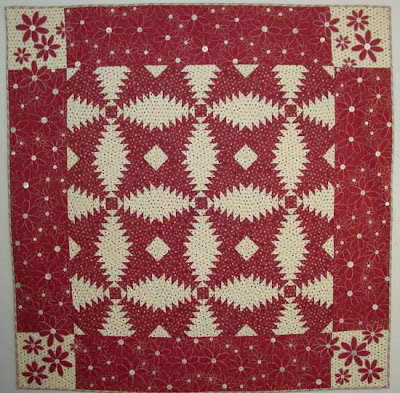 If you come back on the "Wicked Blog Hop" (see link on the sidebar), my day to post is October 24 and I will have something similar to this quilt as my posting. And I will have a FREE pattern to make your own mariner's compass with either spooky fabric or any fabric of your choosing. You have to sign up to either be a follower or follow by email. Then you'll be notified of that blog posting. Day 4 - My Day! This is my favorite, absolute favorite time of year. And October - well, it's just the best where I live. 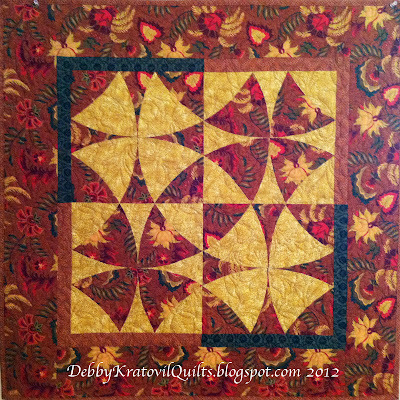 I am so excited to blog about a theme with autumn and leaves in blocks and quilts. Many thanks to Madame Samm and Cherry for organizing this. They are just the BEST! I loved Autumn so much when I was growing up I even dreamed of a Fall wedding. And I got one - in April of 1977. Huh? That's Spring, dummy. Not if you live south of the equator. I was living in Swaziland, Africa at the time; met, fell in love and married this awesome man from Texas named Phil. And April in Swaziland is Autumn. See - dreams are possible! OK. 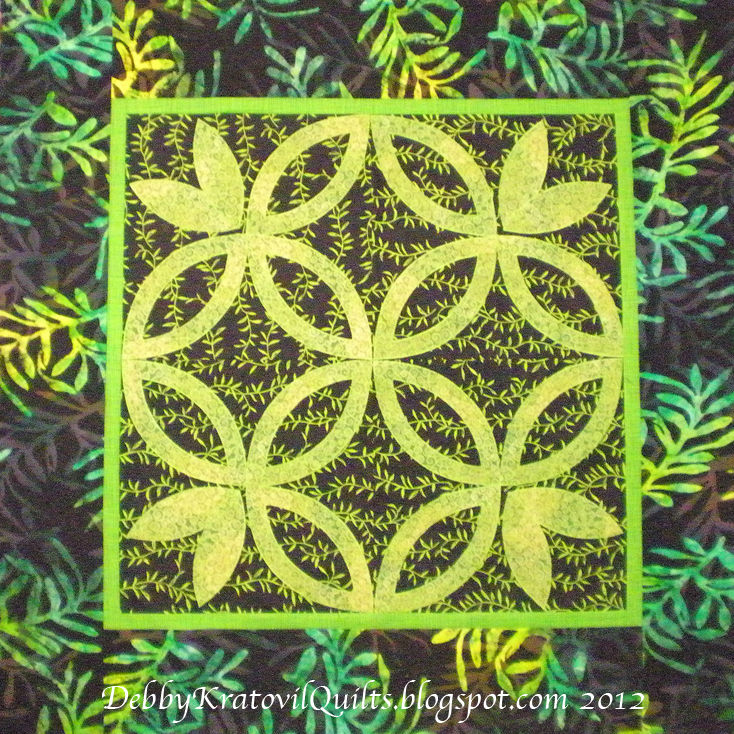 Here is my block for the hop: Winding Ways. I used the Sonoma Collection and Gilded Greenery from Blank Fabrics. Aren't these gorgeous? I bought a bolt of each!! 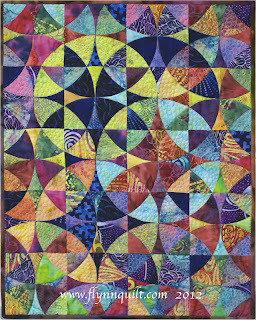 Winding Ways Block - 10"
My first block uses colors that are warm and rich. 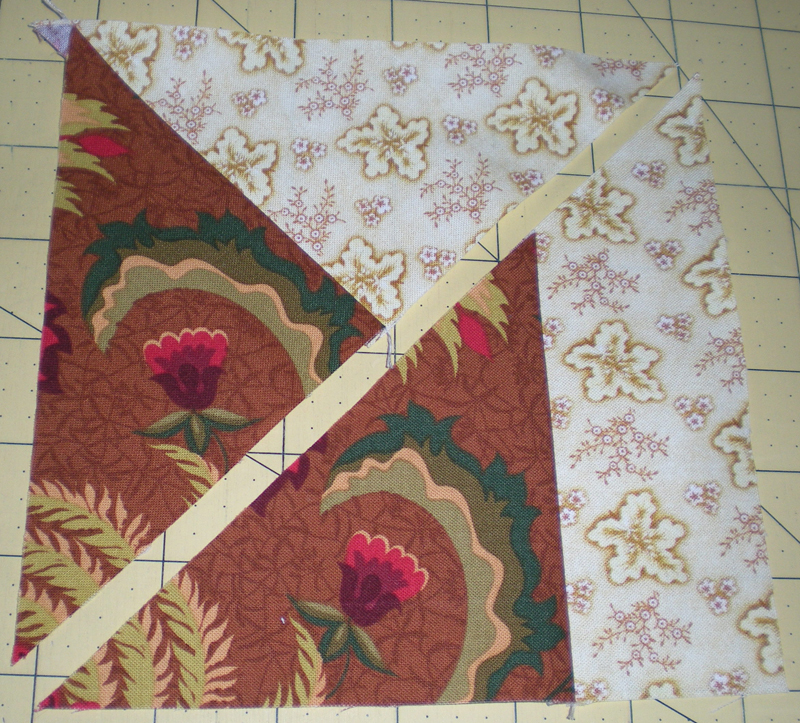 The Winding Ways block is not an easy block to sew. I ordered a template set from John Flynn's company and the beauty of using them is that the points are nubbed for an excellent match. Even better, I had a class set of 20 kits laser cut by his daughter Kate. 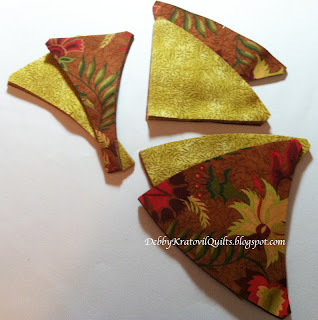 Let me tell you, they are a breeze to sew when they are cut for you. Even my beginning students got a perfect match. 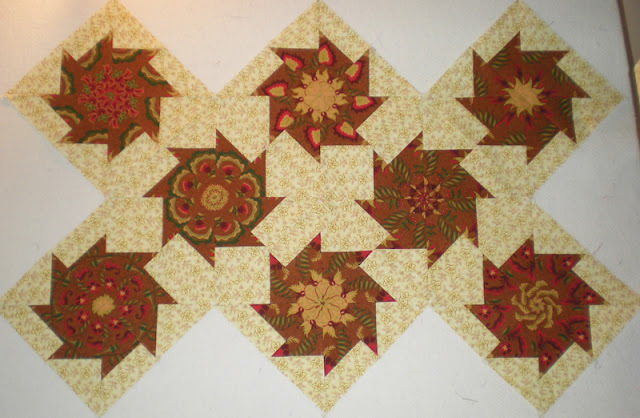 Notice the piecing on the right side of the block. 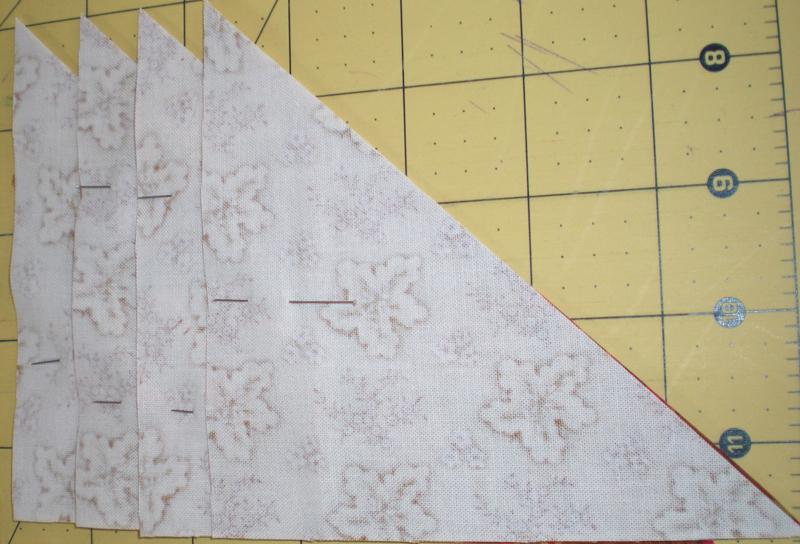 There is a system to adding the patches in order, pressing the seams a certain direction and - taking your time! But I think I did a pretty good job, don't you? 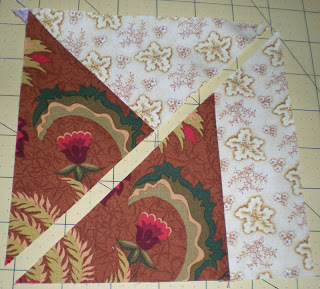 Then the two sides are joined in the curved seam. But, hey, what does it really look like from the wrong side? So glad you asked! Yes, it really does matter how you press the seams. Notice how they are split half-way along the curved seams (other than the center seam, which is pressed open). This allows for a very, very flat block without little hills and bumps. 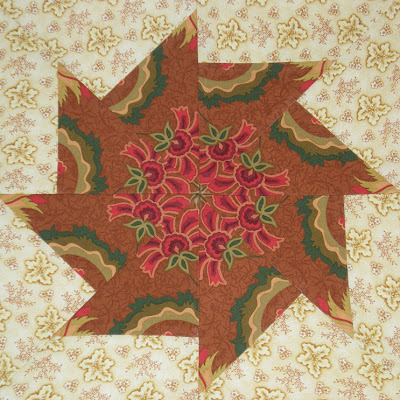 Single block using Holiday Splendor from Blank - one of my favorite collections! 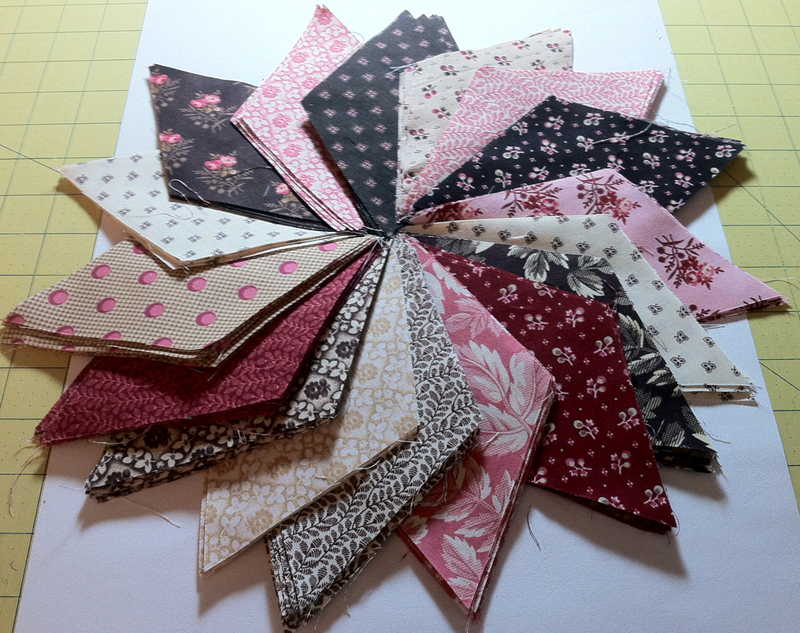 Every so often, I take out some of my pre-cut patches and sew another block or two. The patches really, really do line up. Getting a true 1/4" seam is a must. 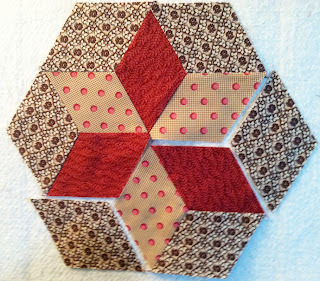 Four blocks using Holiday Splendor - I'm giving away a set of the laser cut blocks. Just wanted to show you one of John Flynn's laser cut kits in the warm - autumn - colors. 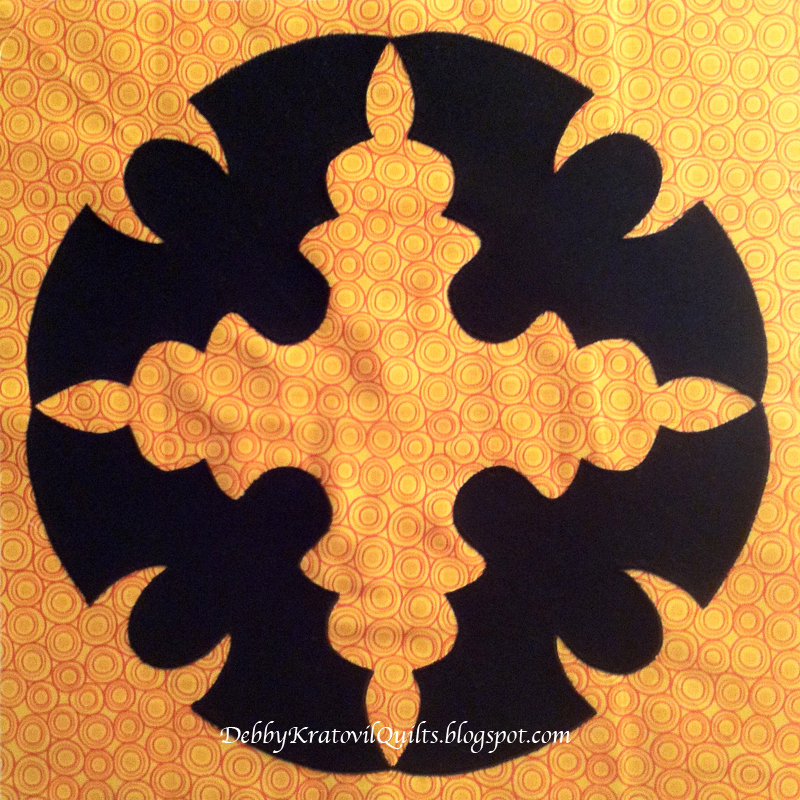 Take a visit to his website to see all sorts of laser cut kits, mostly in batiks in a variety of block sizes. 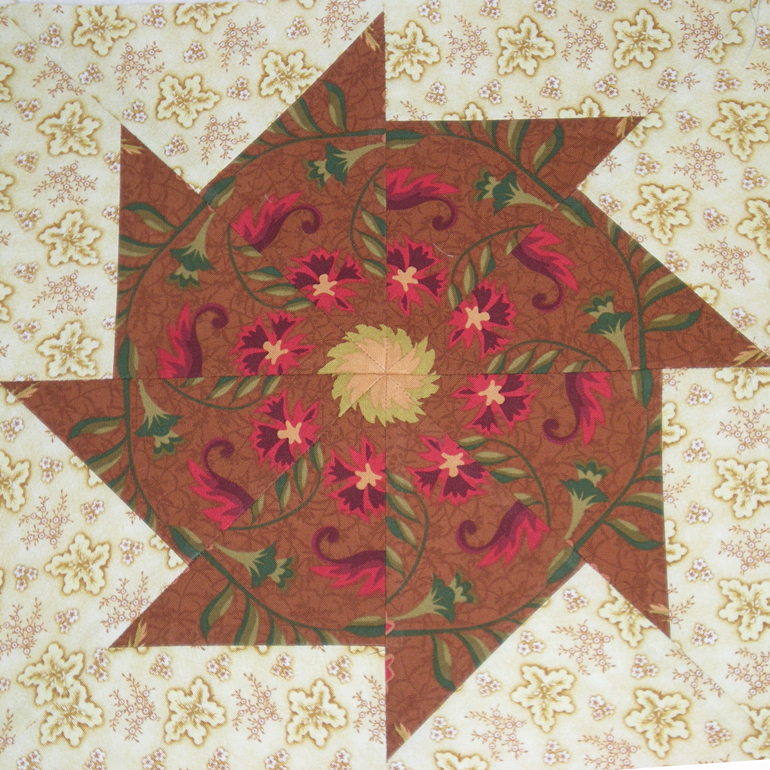 One of the laser cut kits in 1860s colors - beautiful! 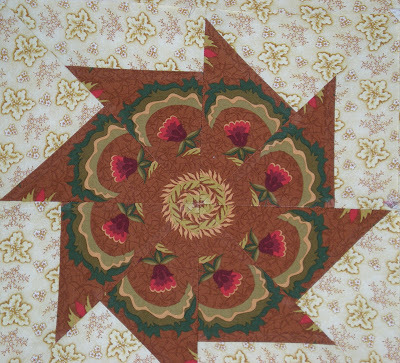 Many of John Flynn's kits are created with luscious batiks. Visit John's page that showcases all the pre-cut kits. 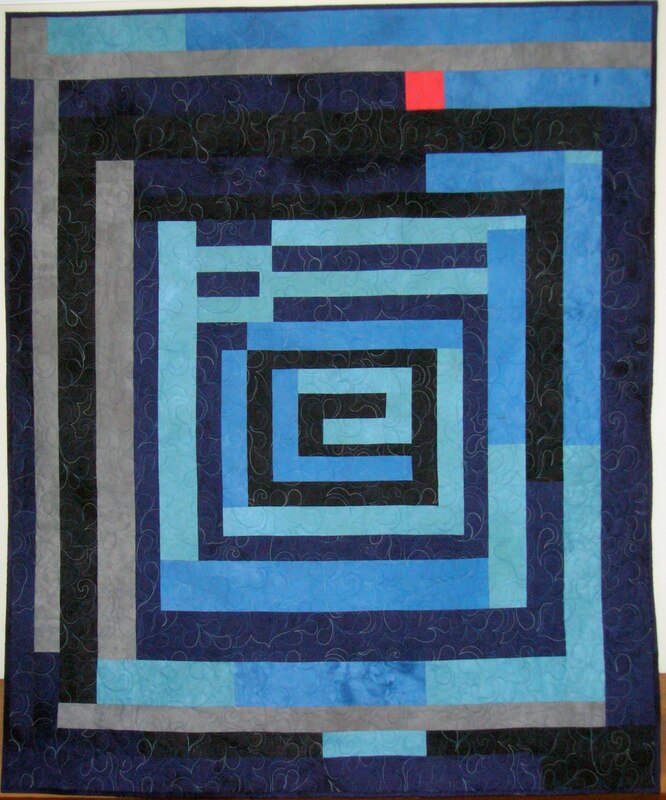 There is a wide variety of styles and blocks. Double Wedding Ring block- 12"
This is a template set that I had custom cut for my pattern (which I teach in classes and sell as an individual pattern) and notice the little leaves at the corners of each of the four blocks: these are the cutaways from the larger green wedding ring wedges. 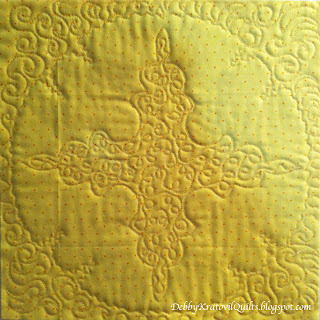 This is an easy way to get a quick Double Wedding Ring quilt without all the piecing (raw edge appliqué). 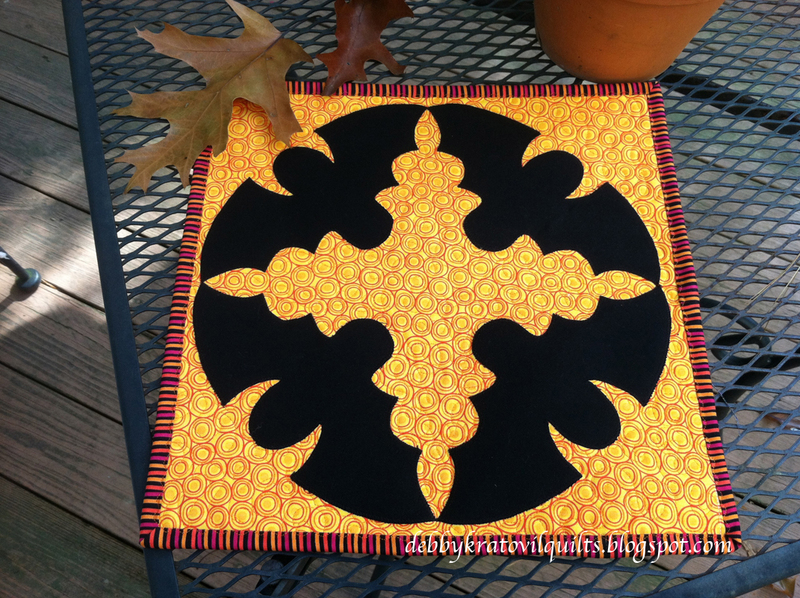 I actually had a quilt like this in my first book (Bold, Black and Beautiful, 2004) and decided to update it with today's batiks and textured blenders. OK. What are my giveaways? I have THREE today for a total of THREE WINNERS! 1. A set of the laser cut patches to make the warm brown FOUR BLOCK QUILT CENTER (I don't have any border fabrics left). This includes the pattern for making the quilt. Awesome, laser cut patches. Can you see the little notches? 2. 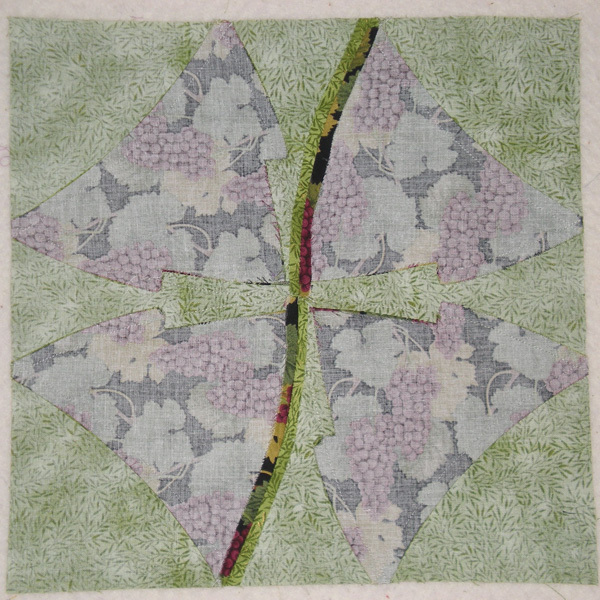 Two half-yard cuts, one of which is the Sonoma black and burgundy grapes fabric as shown in the first block. The other is a soft butter yellow. 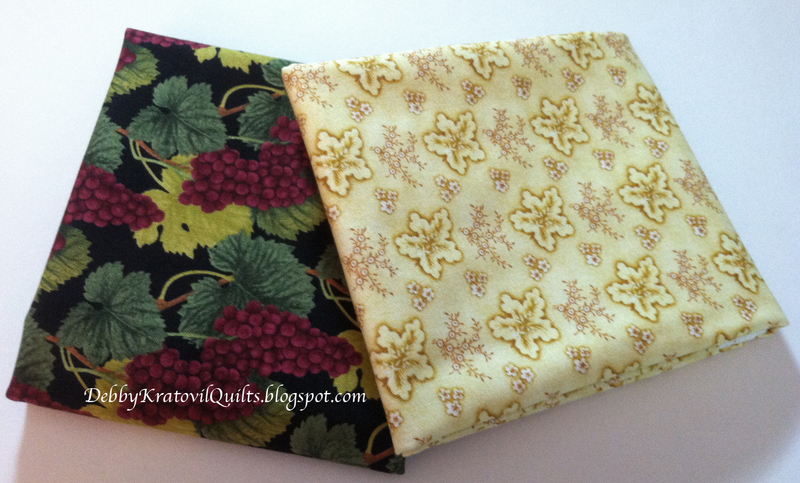 Both are from Blank Fabrics. 3. 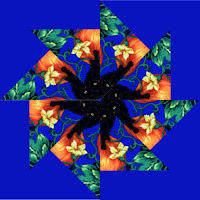 The pattern with acrylic template for making the Double Wedding Ring Blossoms quilt (can find this at my web site; click link above). Just leave a comment. 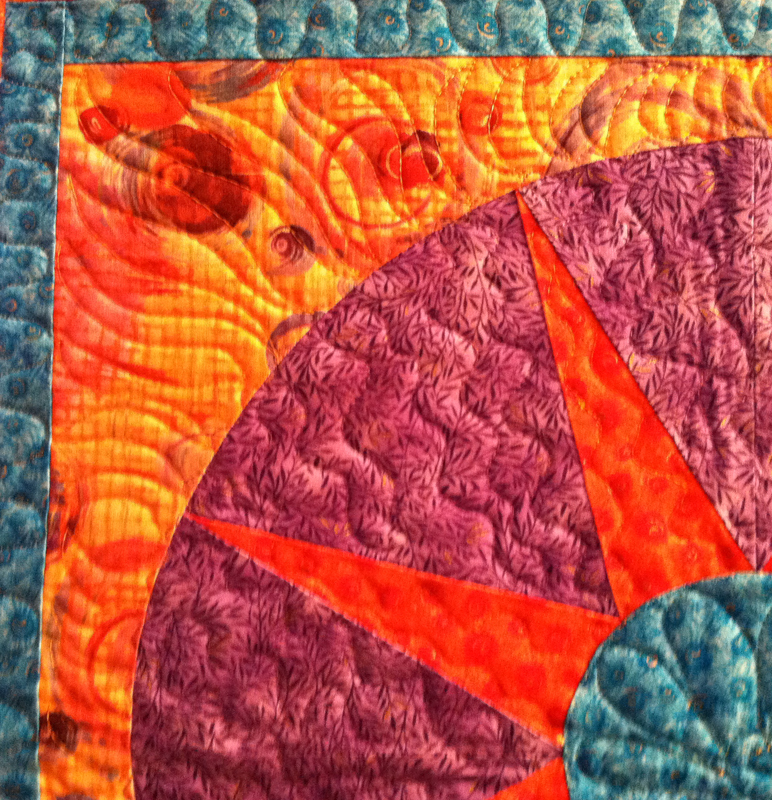 Tell me which of these 3 quilts you like best. And, if you are chosen, which of the 3 prizes you would like. Yes, I have enough of each of these 3 prizes to grant your wish! I have to have your email; no email, no prize. Yes, I will include international addresses if you are a winner. Contest closes at midnight October 10. Will notify winner after that.